This is a bit sad. Men with money rang their way into a phone auction last week to pick over the carcasses of 38 Studios and their subsidiary, Big Huge Games, the creators of last year’s Kingdoms of Amalur: Reckoning. Good homes were found for Rise of Nations and Rise of Legends – hangovers from Big Huge’s past lives as developers of decent real-time strategy games. But no one could be persuaded to bid convincingly for EA’s biggest RPG push since Dragon Age. 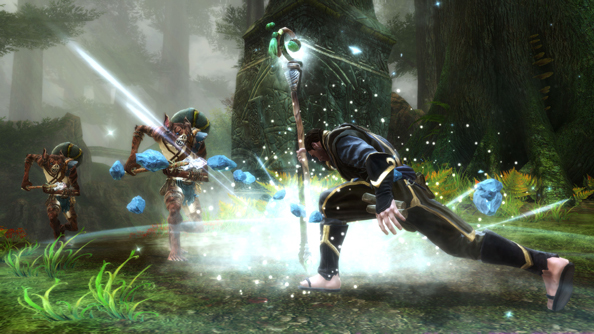 Heritage Global Partners, the company handling the auction of 38 Studios’ assets, was unable find a buyer for the sequel or merchandising rights to Kindoms of Amalur – or for Project Copernicus, the mid-development MMO set in the same universe. No “acceptable offers” were made for the game, despite an 81% PC average on Metacritic – a metric publishers tend to find pretty convincing. 38 Studios’ social gaming platform, Helios, also failed to find a buyer. But that’s less surprising than the ignoble demise of a universe put together by lauded Forgotten Realms author RA Salvatore, and debuted with a game put together by Elder Scrolls veteran Ken Rolston. A game which was, according to the few accounts that emerged after its release, really rather good – a compelling blend of WoW, Fable and combat Platinum Games could be proud of (come to think of it, where are they in all this? They seemed keen enough to pick up Darksiders “on the cheap” when THQ went under). 38 Studios filed for bankruptcy in 2012 after years of spending on Project Copernicus. The majority of their $75 million loan from Rhode Island’s government is expected to be paid back by local taxpayers for years to come. Which has to place this among the grimmest failures in game development history. Did any of you lot play Reckoning? What did you make of it?